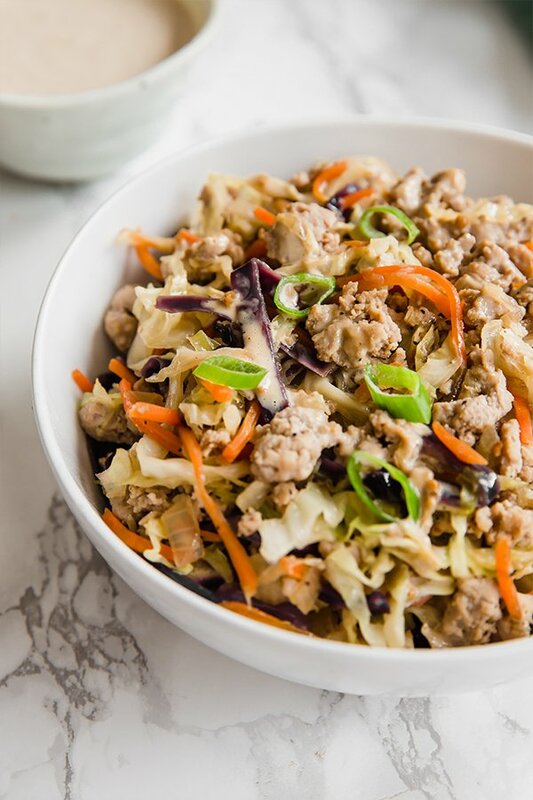 This Egg Roll in a Bowl recipe brings back all of the flavor and nostalgia you love about egg rolls without the wrapper! It’s paleo, whole30, AIP, and keto. When it comes to any takeout, I feel like everyone is always down for adding egg rolls to their order. Or at least that’s how I got acquainted with a love of egg rolls growing up. My little brother was always asking for them, and who could blame him? Who doesn’t love a crispy and flavorful egg roll? I haven’t had an egg roll in years since I’ve gone grain free. I completely put them out of my mind… until I became acquainted with the idea of an egg roll in a bowl. All of the flavor of egg rolls but without the fried wrapper! That why I decided to make and AIP, Whole30, keto, and Paleo version of an Egg Roll in a Bowl featuring a ginger cream sauce. I know what you might be thinking… what’s an egg roll without the wrapper? And I hear you! But this dish has so much to offer, if not more, for being made without the wrapper. Really, this meal is all just good quality veggies, protein, healthy fats, and a yummy sauce. It’s the perfect dish to cover all of your bases and is a great dinner to batch cook and have for leftovers for lunch! Make it on the weekend and use it as meal prep for the week! 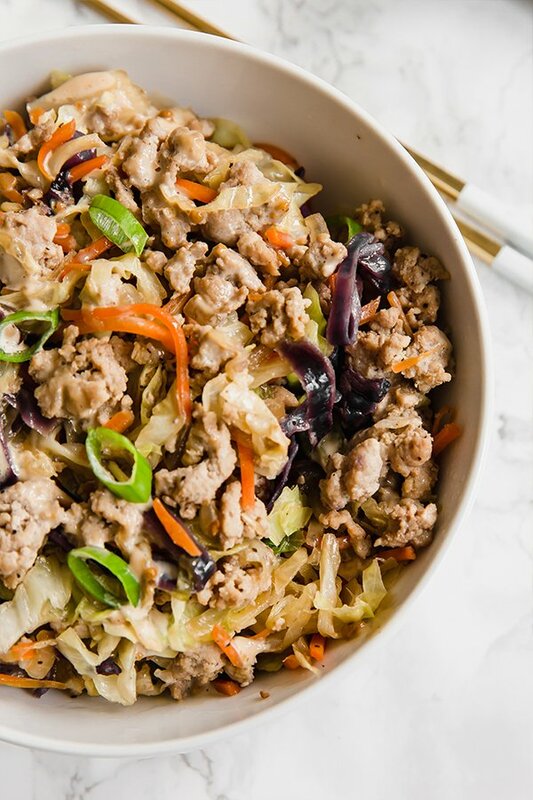 This egg roll in a bowl is perfect for batch cooking! Make it on Sunday and store it in separate Tupperware containers to make a quick and easy grab and go lunch. Serve the sauce on the side if you plan to meal prep it. Don’t want to use pork? That’s a-okay! This recipe is totally flexible. You can use ground chicken thigh, ground turkey, or even ground beef. Make sure you don’t use a coleslaw mix that has a ton of carrots as it may be too much sugar. Some have more sugar than others. Grab a prepped coleslaw mix at the store that features shredded green cabbage, red cabbage, and shredded carrots for a short cut. If this isn’t accesible for you, you can easily buy these ingredeints seperately. White onion is in the base, and green onion is used as a garnish. Pork is what I’m used to in an egg roll, but you can easily swap out something like ground beef, chicken, or even turkey. 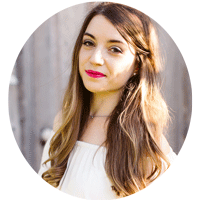 You can easily sub coconut oil if you’re AIP! These add the classic flavors that you would find with an egg roll. Omit the pepper for AIP. You can also use rice wine vinegar if you tolerate it. Coconut aminos is the soy sauce substitute. For the sauce, you’ll need coconut cream, coconut aminos, ginger, salt, and apple cider vinegar. 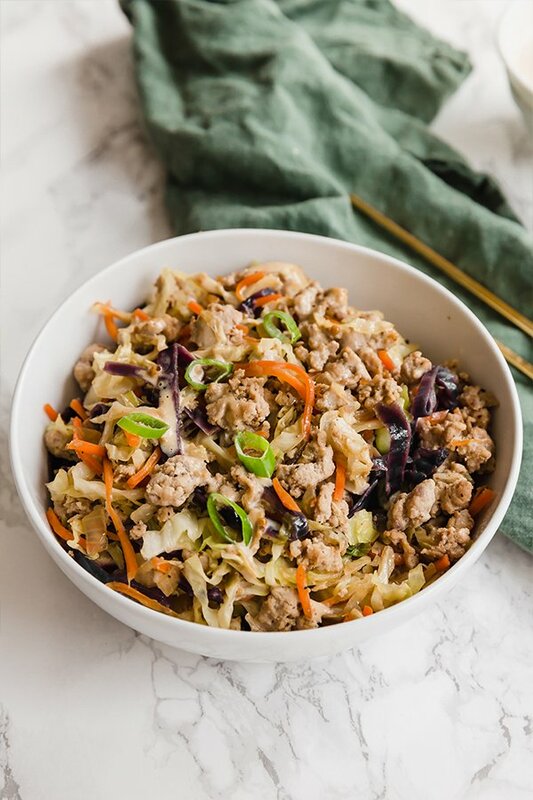 This Egg Roll in a Bowl recipe brings back all of the flavor and nostalgia you love about egg rolls without the wrapper! In a large skillet, brown the pork on medium heat and lightly season with salt and pepper. Once cooked, set aside. Discard the fat. Using the same skillet, heat the oil on medium heat. Saute the onion, garlic and ginger until fragrant and the onion is translucent. 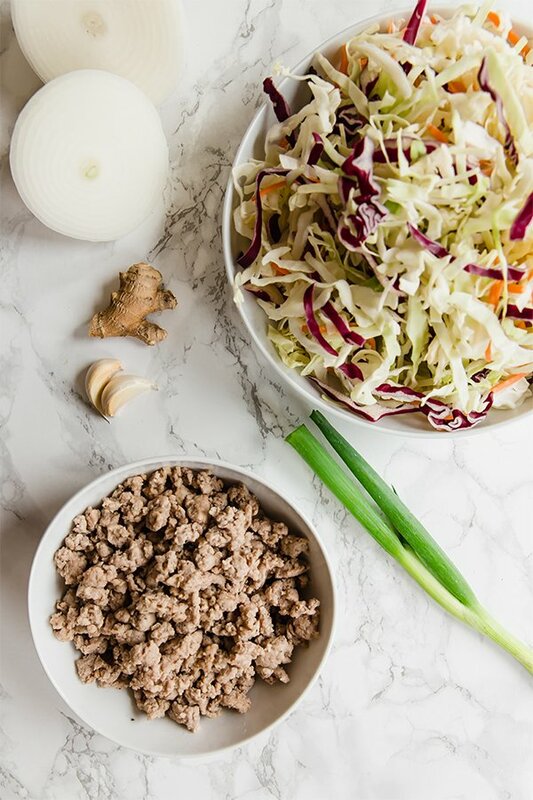 Pour in the coleslaw mix as well as the apple cider vinegar, coconut aminos. Season with the remainder of salt and pepper. Stir well to combine. Saute for 4-5 minutes or until the cabbage reduces in size and the carrots soften. Reincorporate the cooked pork and stir to combine. Saute for another minute to reheat. Remove from heat and topped with green onion and optional sauce (see below). Combine all of the ingredients in a bowl and whisk together. Serve over the bowls. And just like that, you have all of the flavors of your favorite takeout in one bowl! My husband and I had both dinner and leftovers with this meal, and we’re happy to keep enjoying it. It’s flavorful, filling, and the sauce really just ties it all together. Enjoy, and be sure to let me know if you try it out! This recipe first appeared on Unbound Wellness in January of 2018 and was updated in March of 2019 with new photos. Ooh, can’t wait to try this! I just added green cabbage to my organics delivery and have been trying to figure out a way to use more of it. This looks perfect. Yes. This hit the spot tonight. I am entering my 5th week of AIP and am getting so bored. I finally ordered a bottle of coconut aminos and am so glad I did. I’m bringing this for my lunches this week. Thanks! You can find coconut aminos online or in health food stores. 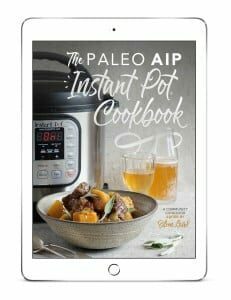 I have a guide to AIP here. Great recipe, thank you! I made the recipe just as described but added a few mushrooms because I had them on hand. The flavors were perfect. I’ll be eating this for lunch this week. I skipped the cream sauce. I made this last night and it was delicious! I slowed cooked a chicken to make a homemade broth, which I think adds such a rich flavor to soups. I omitted the Coconut Aminos because I only tolerate it occasionally, so use ti sparingly. It was still sooo yummy! Thanks! I LOVE this recipe. I have made it twice now, once with turkey and once with pork. The sauce really makes this dish, so I would not skip it! I make it on the weekend and increase the amount of each item slightly so that I have lunches throughout the week. It keeps quite well. Yum! Can you reheat the sauce or eat it cold or what? Do you think this could be adapted for a crockpot/slow cooker situation? I’ve never tried it, but maybe! Let me know if you do. I made this tonight, so good! Thank you!